Many Parents switch to cloth diapering for many reasons, the cost of diapers is one of them. If you are looking for affordable cloth diapers, then you have come to the right place! I would like to introduce you to BB Cloth! These affordable diapers are one size pocket diapers, which means they will fit from birth to potty training. BB Cloth sent me one of their pocket diapers to review on my newborn. These pocket diapers are made with a PUL outer layer and Suede cloth inner layer that wicks away moister from baby's skin. 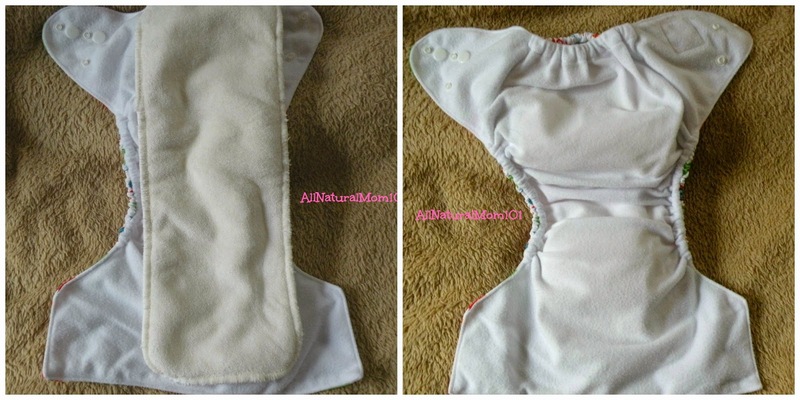 There are three rows of snaps for adjusting the size to fit your baby. Above on the left, is the smallest setting and the right is showing the largest setting. Smallest setting (bottom row) fits from 8-15lbs, Medium Setting (middle row) fits 12-25lbs and the Large setting (no snap down) fits from 20-35+ lbs. Every Diaper includes one 3-layer microfiber insert. Here is the one size diaper on my 6lb newborn. We love this diaper! It's actually quite trim on my little man. Overall its a great diaper! What I love the most about BB Cloth, is the price! Super cute diapers for a super affordable price! I will for sure be adding more to our stash! Find BB Cloth on Facebook! Follow BB Cloth on Twitter! Disclaimer: I was given the products in this post at a discounted price for the purpose of my honest review. I was not paid in any way to write this review. Review is Sponsored by BB Cloth. 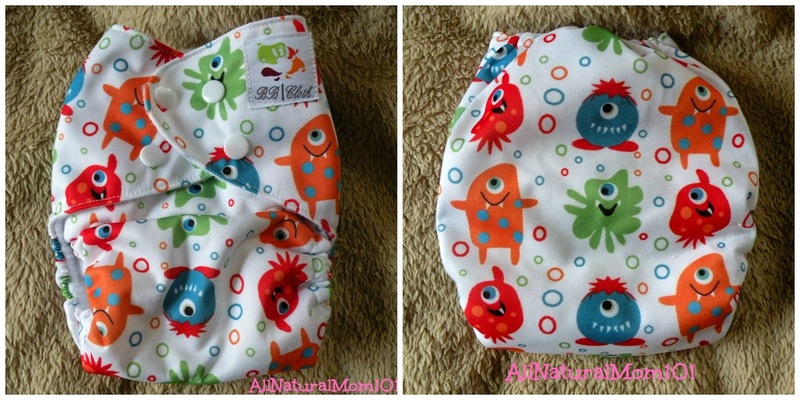 BB Cloth has chosen to giveaway a One Size Pocket Diaper in Monsters Print to one of All Natural Mom 101's Readers. 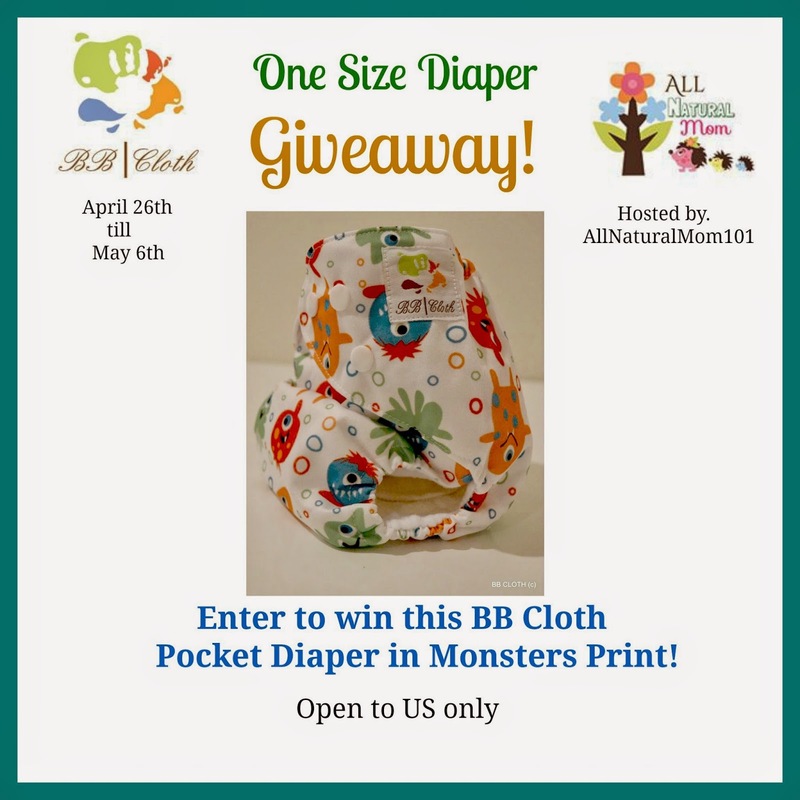 Winner will receive a BB Cloth, One Size Cloth Diaper with insert . The Giveaway Starts April 26th-May 6th. Open to US residents only. We wanted to save money, and also have more reusable products in our home! I wanted less waste, less chemicals, and to save money. We started cloth diapering because it was cheaper than the Cadillac dispoibles we were buying and my son has sensitive skin. Cloth helped tremendously with his rashes. This diaper looks really nice! Choir print, and if be really interested in trying out a suede cloth interior. To save money - I simply couldn't afford sposies at the time. I guess the environment was #1, but the money savings was a close #2! I also didn't like the idea of having chemicals on my baby's skin. The number one reason is the environment. Too many diapers in landfills. I got sucked in by all the cuteness! I started because they were so soft and adorable! The fact that I don't have trash just adds to the perfection! Pretty amazing that this one-size fits from 8-35 lbs! And the little monsters are so cute! the chemicals in disposables are scary and dangerous and they create terrible waste. i love how much better it was for my kids and was so much more comfy for them! I started to save money. To keep the nasty chemicals away from my baby! My baby girl poops out the back of all disposables. And now I'm obsessed with cloth! to save money, better for environment and so cute! I haven't started, but will be starting when my little one gets here at the end of the month. I read about the benefits of cloth. The price, the environmental , the health. To save money and avoid drastically increasing our house's trash output. I want to to save money and be more environmentally-minded. Diapers cause so much waste and cost so much throughout the young lives of all your kids. I started cloth diapering because it's healthier for a baby, more fun ;) ( this is my second child so I needed to make those diaper changes more exciting ;) ), and due to environmental reasons. I'm so glad I did. Thanks to cloth diapering I realized how many other disposable things can be replaced by reusable cloth. My son is allergic to disposables so we had to switch to cloth and we are loving it! My baby was a surprise birth control baby & shortly after finding out I was pregnant his father left, never saw him again. A week before I found out I was pregnant i accidentally won a cloth diaper, never knew about them until then! Started reading up & I really liked that they are Chemical Free. ;) & help the environment, Saving money is just a huge bonus! I started to save money!